Amtrak trains go to every cruise port in the USA. If you don’t live near a cruise ship port, your choices on how to get there are limited. Endure a long-distance car ride or for even more stress, cram yourself and your family into an airplane. Some people simply refuse to fly, which seriously can limit their travel chances. There is a better way to get to your cruise ship: Take an Amtrak train to a cruise port! Amtrak is America’s passenger train. Arrive at an Amtrak station 45 minutes before your train is scheduled to arrive. After the train attendant helps you step onboard, you’ll nestle into your sleeping compartment or reclining wide seat. With over 500 stations in 46 states and Washington, D.C, there’s bound to be an Amtrak train to get to your cruise ship’s homeport. Ready to take an Amtrak train to your cruise port? I’ve listed all cruise ports by state and the Amtrak trains to get you there. There are two daily overnight trains, operating two different routes running between Boston, New York City and Washington DC, all the way to Miami. Roomette for two aboard Amtrak’s Silver Meteor or Silver Star between Miami and New York City. One train, the Silver Meteor, runs along the eastern seaboard, including Jacksonville, Orlando and Winter Park for Port Canaveral, Ft. Lauderdale and Miami. The second Amtrak train to Florida, the Silver Star, follows much the same route as the Silver Meteor for most of the journey. North or southbound between Rocky Mount, NC and Savannah, GA, the Silver Star veers inland to service passengers in cities that include Raleigh, Southern Pines and Columbia, SC. If you’re cruising from Tampa, the Silver Star will directly get you there. The Silver Meteor follows the same tracks to Orlando and Kissimmee but then passengers leave the train to board a dedicated Amtrak motor coach to Tampa. Both trains go all the way to Miami so those headed to Port Everglades in Ft. Lauderdale and or PortMiami stay onboard. Upon arrival at any of the destinations, it’s a short taxi ride to the port or better yet, a pre-cruise night hotel. If you’re cruising from Port Canaveral, I suggest that you plan to depart the train in quaint Winter Park rather than busy Orlando. At either train station, you can arrange a car rental or pre-book a shuttle service. It’s an easy, 1-hour drive to Port Canaveral or a local area hotel in Cape Canaveral or Cocoa Beach. Just because you live hundreds or even thousands of miles from the cruise ports in Los Angeles, doesn’t mean spending hours in the sky to get there. Amtrak operates four almost-transcontinental trains from the east coast, Midwest and southern states as well as an overnight train from Washington state. Connect in Chicago for a scenic ride aboard the Southwest Chief to Los Angeles, CA. Your overland coast-to-coast journey begins in New York City or Washington DC. Both cities have three overnight trains to Chicago. the next day, westbound from Chicago, there are two trains going directly to Los Angeles; the Texas Eagle via San Antonio in almost three days (due to a long layover in San Antonio, but you’re asleep in your compartment) and the Southwest Chief, a much shorter trip of around 43 hours. The scenery is amazing on both trains. You can take the California Zephyr from Chicago to Los Angeles but it’s not a direct train. You have to change in Sacramento and then continue on to L.A.
My suggestion? Take the train with the most breathtaking scenery, the California Zephyr, to Sacramento, stay over a couple of nights to have time to visit the incredible California State Railway Museum. You can then catch the historic Coast Starlight at 6:30am and arrive in Los Angeles at 9pm. There are two hotels in a 10-minute walking distance to the train station. Amtrak Superliner Bedroom aboard the Southwest Chief features a private en suite shower and toilet. Arrival into the splendidly restored Los Angeles Union Station is an experience in itself. Taxis are available just outside the station. Whether you live on the west coast, east coast or the Midwest, you can easily get to the Port of New Orleans and the Texas ports at Houston (Pasadena) and Galveston. The Sunset Limited, originating in New Orleans and Los Angeles, departs three days a week in either direction. Cruisers from the west coast can depart their train in Houston or New Orleans. Leaving from Chicago, passengers board the famous City of New Orleans train for a quick overnight ride down to the Big Easy. From there, cruise ships head out to the Caribbean and twice a year Transatlantic crossings to Europe. New York is the departure point for the Crescent, en route to New Orleans via Philadelphia, Washington DC and Atlanta. Heading to Houston, transfer in New Orleans to the Sunset Limited for a short 9-hour train ride. From Houston, Amtrak provides a dedicated motor coach to Galveston. Ride an Amtrak train to get to New Orleans for a Mississippi River cruise or head out to the sunny Caribbean on a cruise ship. Cruise from the Port of New Orleans aboard an authentic paddle wheeler and step back in time on a northbound Mississippi River cruise. Or leave from Chicago aboard the Empire Builder to St. Paul, MN and begin a southbound cruise on the Mississippi. Memphis or St. Louis, too. Travel from New York to Chicago and transfer to the Empire Builder to Seattle on one of the most scenic Amtrak train rides in America. Once the train gets to the western side of Montana, the Empire Builder travels straight through Glacier National Park. There’s even a train stop at one of the National Park Lodges, where you could spend a day or two pre- or post-cruise. From the Port of Seattle, train passengers might find a round-trip 7-night Inside Passage cruise more convenient that a one-way cruise to Anchorage. But if you want to travel into the heart of Alaska and into Denali National Park and beyond, you’ll have to take a one-way cruise between Anchorage and Seattle. Then book passage on the Alaska Marine Highway System to/from Bellingham, Washington. Seattle is only a 90-minute drive from Bellingham. Those who depart from Seattle for a longer cruise to Asia, Hawaii or even Australia will love Amtrak’s generous luggage regulations. Each person is allowed to carry on 2 bags up to 28” tall and up to 50lbs. Passengers may also check up to 2 bags for free, same height and weight restrictions and 2 additional bags at $20/each. That’s a lot of luggage. Southern Californians can hop aboard the historic Coast Starlight for an overnight ride to Seattle. Hugging the Pacific Coast for several hours before ascending the Sierra Nevada range, the scenery is spectacular. Not to mention the private lounge and dining car for first-class passengers. 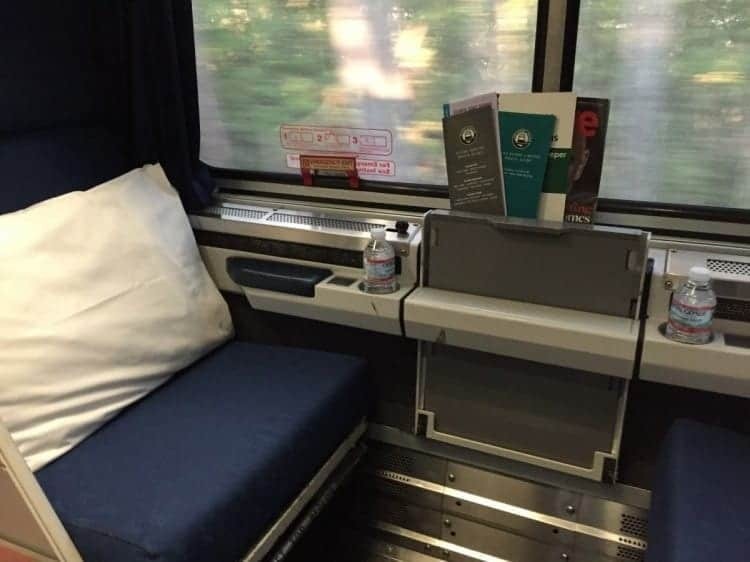 Relax in the First Class Parlour Car aboard the Coast Starlight as you travel the California coast between Los Angeles and Seattle. ALWAYS arrive the day before, just as you should if you’re flying to your ship. If you’re traveling in coach, bring a light travel blanket and small pillow. First class sleeping compartments include bottled water, juice, sodas, and all meals in the dining car so you don’t need to pack a picnic. The Silver Star no longer has a dining car. However, there is a Club Car with buy-your-own food and specialty beverages. If you’re in a sleeper, your car attendant can place your order bring room service. Rates for sleepers increase as supply decreases. Book your accommodations early. If your plans change, new cancellation penalties allow for some flexibility. Purchase travel insurance that covers missed connections, just in case of a severe delay or if you need to cancel for covered reasons. Stop in a nearby Amtrak station or call 1-800-USA-RAIL and request a National Timetable to be mailed to you. While the Amtrak website is excellent, it’s very convenient to map out your rail journey with the timetable at hand. An Amtrak train ride to your embarkation port may not be the solution for everyone, especially for those that are on a time constraint. For people who live in South Dakota, Wyoming or most of Idaho, this probably isn’t an option, either, as there is no train service to these areas. But for most of us across America, there is an Amtrak station no more than a half-day’s drive away. Let your vacation begin before the cruise; take the train and arrive refreshed, relaxed and ready for another adventure. « Do You Need a Passport to Take a Cruise From the U.S. Sorry for the delayed reply. I hope it’s not to late for my advice. Yes, arriving the day of departure can be pretty stressful. You’re counting on the train running exactly on time AND the Beachline road to not have delays. Considering cutoff time for embarkation is probably 3pm at the latest, it’s risky. It can be much more relaxing to arrive into Orlando (I’d suggest the Winter Park station instead), take or rent a car and spend a day in Cocoa Beach. Then return the car and go at your leisure to the port the next day. I hope this is helpful. Have a great train ride and a fabulous cruise! Thanks so much for this informative piece. I’ve seen folks recommend getting there a day ahead. We’re planning on taking the train from Boston to Orlando to arrive at 10:30ish in the morning. The boat departs at 4PM. Is this pushing it too close? Hi Jan, Your frustration was my inspiration to do the article! Thank you! And have a wonderful cruise. Hi Jan, Thank you for your question. It prompted me to do another “how-to” article! Here’s your answer: https://cruisemaven.com/how-to-get-to-cape-liberty-cruise-port-amtrak/ Have a wonderful cruise and thanks again for your comment. It’s very easy when you take the train into Penn Station. You didn’t mention if you were cruising from the Manhattan Cruise Terminal or out of Brooklyn at Red Hook…or even Bayonne, NJ which sometimes is confused with a NY departure. I’ll go with Manhattan for you. There isn’t any shuttle that runs back and forth to Penn Station. However, it’s only a short distance and you’ll need either a taxi or an Uber. If you choose a taxi, here’s where to find it at the station. Once you leave the train, take the escalator to the main level. It should put you directly in front of the Acela Lounge. As you step off the escalator, the Acela Lounge is right behind you. The escalator to the outside is right next to the Acela Lounge. Look for 31st Street and 8th Ave. Once outside, you’re facing exactly the corner of the two streets. veer to your right and that’s 8th. Walk 1/2 block to your right and you will see the taxi queue. Get into the taxi and close the door and then tell the driver you’re going to the Manhattan Cruise Terminal (assuming you’re not going to Brooklyn which is about a $60 ride. If you decide to call Uber, I’m not sure where it will collect you…probably on 8th near the taxi queue. But that’s it! Taxi or Uber to Manhattan Cruise Terminal. Have a wonderful train ride and cruise! I hope you didn’t mind all this detailed instructions. Thank you for your question! We are thinking about taking a train from Greensboro, NC to New York. Do you know of any shuttle or any other transportation to get us to cruise port in New York? Hi Ken, Thanks for reading the article. Amtrak doesn’t furnish designated shuttles between the station and the port. It’s only about 12 miles away. Your best bet would either be Uber or a taxi. One of several taxis is (904) 355-8294. The cost should be around $30-ish. You can also visit: http://www.visitjacksonville.com/meetings/transportation/ground-transportation/ and look through available options. I don’t know how many people are traveling with you so at the VisitJacksonville site, it also lists shuttle vans services for larger parties. I hope this helps. If you booked your cruise and rail with a travel agent, she/he can also help even further with connecting transportation. Have a wonderful trip and happy travels! We are taking a train from Raleigh North Carolina to Jacksonville Florida. Do you know of any shuttle or other services to get us from the train terminal to the cruise port in Jacksonville. Hi and thanks for your question. Amtrak doesn’t provide a shuttle service. But you can find shuttle services online. I can’t recommend any particular service, but a quick check and I see there’s a company PortCanaveralVanService.com that has Orlando Amtrak pickup for the port. Also, there’s Cocoa Beach Shuttle. Just google something like: port canaveral shuttle service orlando amtrak – and you’ll get a whole list of companies. It’s a little over an hour drive to or from the Amtrak station to Port Canaveral. Definitely reserve your return port-to-Amtrak shuttle early, too. Hi taking an Amtrak train from Newark Penn Station in Newark, NJ to Orlando train station . We need to get to the cruise port in Orlando Florida and there are 12 of us traveling on Christmas Eve. Does Amtrak offer a shuttle from the train station to the cruise port? If so, how much is the fare? Thank you. Hi and thank you for your email. It sounds like a great adventure! There’s good and bad news. The good news is that next week a group of Amtrak officials and regional big-wigs are riding a test train from New Orleans to Jacksonville to decide if Amtrak will once again have a transcontinental route rom Los Angeles to Jacksonville. The bad news is that if the Sunset Ltd. resumes full cross-country service, it probably won’t be in time for your high school reunion. That said, the easiest route would be Los Angeles to Chicago. Then onto Washington DC and south to Jacksonville. You’d need to rent a car in Jacksonville for the short drive to St. Augustine. You’re looking at two nights to Chicago on the Southwest Chief, one night to Washington on the Capital Ltd and one night to Jacksonville on the Silver Meteor. Three trains. A great adventure, for sure. If you decide to take the train, call Amtrak, unless you know of a travel agent that is good at booking Amtrak. If you should call to book it yourself and the reservationist doesn’t seem as knowledgeable as you’d like, politely hang up and call back. I find that, as with many customer service call centers, some people seem to know their “stuff” better than others. When you decide on your train and accommodations, for the DC to Florida train, ask that your room isn’t directly over the wheels. The other two trains are Superliners and you can request an upstairs room if you’d like. Thank you for your email. Have a wonderful trip and please do let me know if you take the trains across country! I’d love to hear your story. Good idea to take the train to Penn Station for your cruise (I’m going to assume you are leaving from the Manhattan Cruise Terminal and not Brooklyn Red Hook). You are right…since this is more of a “commuter” train than long distance, there isn’t checked luggage. I have taken a short distance train (Orlando to Charleston) and stayed in coach with my suitcase. But it was only for a long weekend not a cruise. If you think you can stow your bags in the overhead ledge, then you’re good. My main concern is time. In a perfect world, I’d suggest coming in the day before your cruise, enjoy the city and then in the morning, you’re there. Even though it’s a short train ride, if your cruise is in winter, the weather can cause delays for Amtrak. Please carefully plan your arrival into NYC. Of course, if you have travel protection insurance, then you’re covered in case of delays or missed connections. Thank you again for your email and have a wonderful train ride and cruise. Hi, we’re planning(2 seniors) to go to St. Augustine, Florida from LAX Union Station in October for a high school reunion. What are our best opinions to go by Amtrak. And how long would it take us. Our big day is on October 16, 2016…. Your advice is much appreciated. Thank you. We are thinking about taking the Amtrak Keystone Service from Harrisburg to New York for our upcoming cruise. While it’s only a 3.5 hour drive, we want the comfort to relax. I just realized that it does not allow checked baggage. Have you ever been in this situation? It is 4 of us traveling, 2 adults and 2 kids. We could cut down on what we pack (always somehow over pack), but with kids I have to make sure we have lots of extra stuff. Hi, I just now saw your question…sorry for the delay. From Port Angeles, it’s a 3-hour motor coach ride from Port Angeles (6am) to Seattle (9:10am). From there, they can pick up the Coast Starlight, for one of the most beautiful stretches of coastline in the world. It’s a dedicated Amtrak motorcoach so it only stops for ticketed Amtrak passengers. The best advice would be to contact Amtrak directly (1.800.USA.RAIL) and ask the reservation agent. Surely it’s do-able…it just might take a little bit of planning. But the ride along the coast is awesome. Thanks Ryan. It’s been corrected. The California Zephyr does not go to Los Angeles. It runs between Chicago and the San Francisco Bay Area. My daughter and SIL live in Port Angeles, Washington. I want them to visit me in Ontario, Calif. I do know that it is possible to catch the train in Los Angeles to Ontario, but where is the nearest place that they can catch the train from Wash. to Los Angeles? As you wrote in your post, allow at least a day between Amtrak arrival and cruise departure. Mr. L should not do otherwise. Thanks for going in to a little more detail about LA Union Station and reaching Long Beach and San Pedro. San Diego would be a great choice, too. Wanted to mention San Diego because more ships are using it as an embarkation point. Amtrak has 12 trains a day from LA Union Station to San Diego, where trains arrive convenient to all the downtown hotels and the harbor. So sorry you spent that $100. Amtrak offers connecting bus service from LA Union Station to Long Beach (where most hotels are) and San Pedro, which must be booked in conjunction with your rail reservation (by California law). Because this service does not meet every train, you may have to wait awhile. However, Union Station has a Metropolitan Lounge for Amtrak sleeping car passengers, where you can relax. Although I haven’t stored luggage at this location, the Metro Lounge in Chicago routinely does so. If true in LA, that gives you a chance to hop on the Red Line subway from within Union Station to its Hollywood and Vine stop. There within the same block, you’ll find the Kodak Theatre (the current Academy Awards venue), the famed Chinese Theatre (the former Academy Awards venue), and the historic Hollywood Roosevelt Hotel, where Marilyn Monroe lived. This hotel’s fun to explore. In March we took a fantastic train trip around the U.S., more than 8200 miles and loved it. My wife had the brilliant idea to break up that trip with a short cruise from LA, giving us a very welcome change in food and scenery. Our biggest problem was the connection between Amtrak and the port of San Pedro. Cabs were $100+ each way, and we didn’t find many other options. We used the local subway, taking the red line to the blue line, out to San Pedro, and a cab from there to the port, $20 or so. But it was a bit of an adventure, and a tough job to lug our suitcases along. We had a wonderful subway journey, getting into a discussion of our trip with some wonderful locals, but many people might find the task daunting. I highly recommend the journey, but realize that the connection is either difficult or costly. Thanks for writing. I did the train trip into Union Station twice in 2013 for a Princess cruise. Since I always arrive the day before the cruise, I took a shared shuttle for $17 from Union Station to the Marriott Airport Hotel. The next morning, because this hotel was one of the hotels that Princess Cruises used for their pre/post cruise stay, I bought a transfer to the San Pedro port through the cruise line. Also, PrimeTimeShuttle.com provides direct service between Union Station and both San Pedro and Long Beach ports for a flat fee. As you said, taking a private taxi can be expensive. Thank you for your comment.